Many authors and professional organizations question Trauma Surgery’s future as a specialty due to decreased operative volume, inadequate (institutional and individual) compensation and lifestyle. In response to the issue, some advocate increasing operative volume and maintaining financial viability and professional satisfaction by performing procedures that are currently the domain of other subspecialties (neurosurgery, orthopedics). Our aim was to evaluate the quantitative and fiscal contributions of our long standing practice, the academic trauma service (ATS), of including emergent and elective surgery with our trauma practice. Prospectively collected databases from the Emergency Department (ED), Outpatient Clinic (OC) and Operative and Trauma Registries during Fiscal Years ’05 and ’06 for 5.2 trauma surgeons were reviewed. Main outcome measures defined as ATS clinical outcomes, quality assessment and revenue were reviewed in aggregate with the remainder of the Dept of Surgery. There were 113911 ED visits, 4192 admissions excluding observations and 16500 ATS OC visits. Trauma surgery billing, combined, was higher than that of other sections without an increase in morbidity or mortality. Compensation for ATS follows institutional guidelines (academic rank, clinical and academic productivity) exclusive of payer mix. Three thousand two hundred eighty nine operative cases were performed by the ATS. An ATS model based on trauma surgery, emergent general surgery, and an outpatient experience allows for a meaningful and diverse operative experience. This model makes it unnecessary for Trauma Surgeons to acquire skills outside their specialty but, rather, focus on maintaining and advancing traditional general surgical skills. Figure 1: In our ATS model, for the years evaluated, there were a total of 3,289 operative cases. 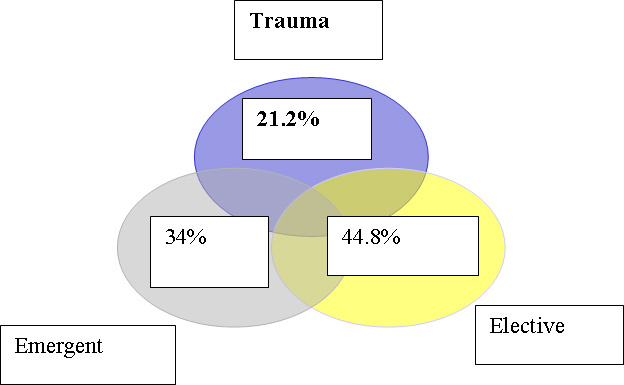 There were 698 trauma cases (21.2%), 1,118 emergent cases (34%), and 1,474 elective cases (44.8%). 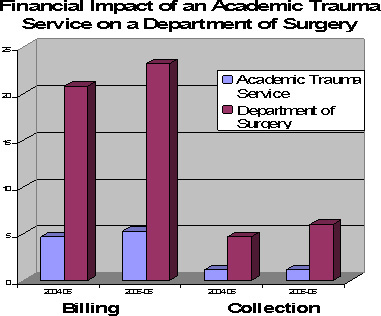 Figure 2: This figure depicts the financial impact of the ATS on the Department of Surgery as a whole. The ATS was responsible for 22.6% and 22.8% of the department’s charges for the respective years. The ATS was accountable for 24.4% and 19.3% of the department’s collections for the respective years.